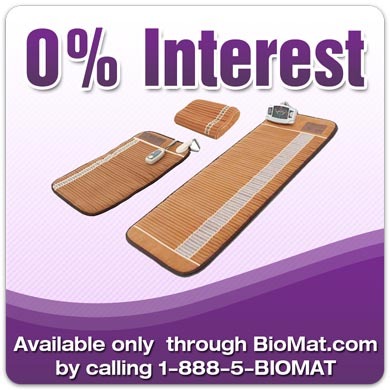 Get the BioMat’s powerful medical and therapeutic benefits working for you NOW and enjoy unlimited access to the proven health benefits of the BioMat’s far infrared rays, negative ion therapy and the superconducting properties of pure amethyst. The BioMat’s unique technology penetrates at the cellular level, it is capable of addressing a wide range of health issues. Many individuals may find relaxing muscles to help them relax body and mind as well. *Please note that shipping timelines for financing orders are longer than standard shipping timelines, please allow up to 4 weeks for delivery of financing orders. If you required quicker shipping time than 4 weeks, your option is a paid in full order, which allows you to select from 2 different delivery timeline options. Please note that shipping timelines for financing orders are longer than standard shipping timelines, please allow up to 4 weeks for delivery of financing orders. If you required quicker shipping time than 4 weeks, your option is a paid in full order, which allows you to select from 2 different delivery timeline options. Your order will be shipped via courier, signature required and you will receive tracking numbers for your order prior to the delivery date. Please note for orders with multiple items, that items are typically shipped separately due to sizes and weights of packages. For your protection each shipment will require a signature. Products purchased through financing do not qualify for professional discount of $100 on the Professional size BioMat or any special bonuses or incentives that may be offered with purchase. Products purchased through financing are considered a final sale and as such no returns are available as products can not be sold as new once shipped to you. If there is a possibility that you may need to return a product you must purchase outright without financing in order to take advantage of the trial period and return option. Products purchased through financing are not eligible for standard distributor compensation. Products purchased through financing are not eligible towards distributorship status or levels. Financing is for US customers only. All products are financed through BioMat.com – Live Well Health Inc.
Financing Orders will be registered for warranty purposes in the name of BioMat.com, unless otherwise noted. Please refer to your financing agreement to determine how your warranty is registered and the order number on your financing agreement for repair or warranty concerns. Please contact info@biomat.com for warranty / repair work. An Administration Fee of $50.00 per item applies to Financing Orders, unless advised otherwise. Please note that Financing Orders may be subject to an additional fee charged directly by your credit card provider. If your card provider does select to charge an additional processing fee it is usually less than 2% of the actual amount of your deposit or monthly payment. Any late, declined or missed payments are subject to a $20.00 penalty per payment late, declined or missed for any reason. Any overdue accounts may be subject to interest. It is the customer’s responsibility to ensure current and valid payment information is available prior to each monthly payment. Copyright © 2010-2019 BioMat.com. All rights reserved.